I’ve raved on and on already, but allow me to rave some MORE about Sofistafunk The Skirt Company. I love the aesthetic – inspired by antiquity, but with a modern sensibility. Their clothing is decidedly feminine and undeniably distinctive, made in Montclair New Jersey by a small group of women with a lot of love in their hearts. The designer, Arlinda Mcintosh, is just such an incredibly genuine, fun, cool, sweet, make-yourself-comfortable kind of woman. I LOVE Sofistafunk. 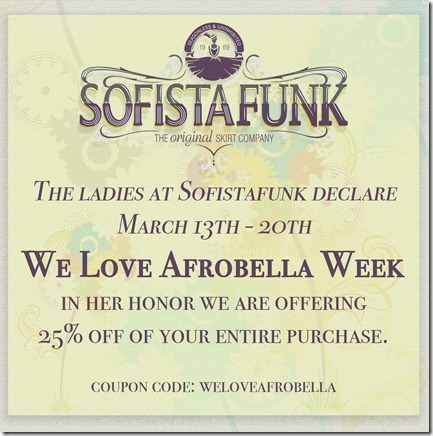 And Sofistafunk loves Afrobella! And now you, my lovely bellas, can enjoy a sweet 25% discount thanks to my friends at Sofistafunk! 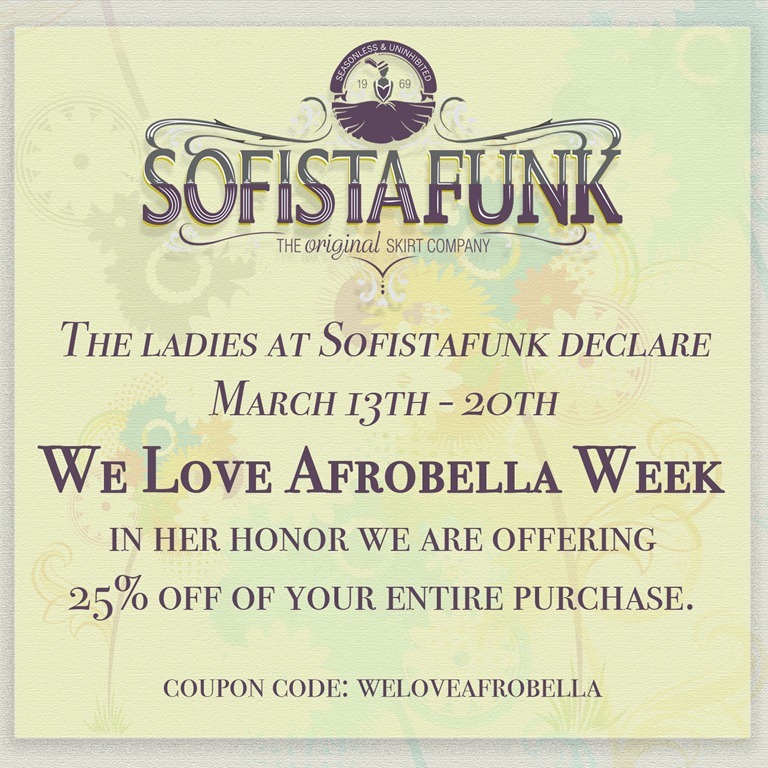 All you have to do is shop to your heart’s content at Sofistafunk.com and enter the coupon code WELOVEAFROBELLA when you check out – and this is valid until March 20. Enjoy!!! I could DEFINITELY see you rocking one!! So absolutely mindboggling for you to have your own “We love Afrobella” week! It’s like you got the keys to Mont Clair. Congrats to both of you! Hi Afrobella,I came across you blog during the Oscar’s.I was so impressed with your website.Please continue to share your insight of the best makeup.My fingers are ready to order.I learned about Ken Gen Do after reading your blog and I love it .Your skin is beautiful and your sweet personalilty radiates from the inside out.I love makeup and skincare and I love your blog. Love your blog, read it every day. Had to check out the sofistafunk site after seeing your beautiful dress. Of course I couldn’t resist and ordered a skirt! It’s a win for all of us! Keep up the great work, and keep representing for all the caribbean girls like us! YAY!!! Which skirt did you get? I love them ALL! I grew up in Verona, the next town over. Jersey represent! I checked out their website after reading your Oscar dress post. Some of their skirts need to be in my closet. I wonder if I can order something and have it sent to my sister, if they don’t ship overseas.